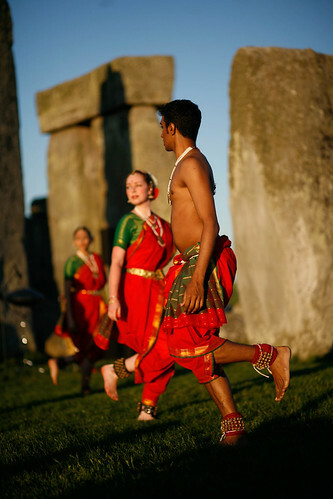 Last Friday I travelled with the other members of Srishti Yuva Culture to Stonehenge in Salisbury. We were there to perform our collaboration with Kuljit Bhamra and his band as part of Salisbury Arts Festival. 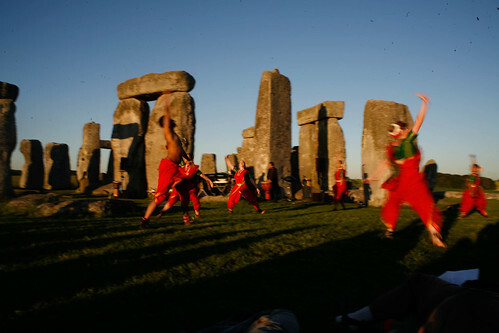 The piece imagined what the stones would say about their experience if they could speak – from their creation within the depths of the earth, to being used to construct a sacred temple by the Druids of Ancient Britain. It was a really unique experience. We began working on the choreography as a group a month ago, but only had one rehearsal with the live musicians. 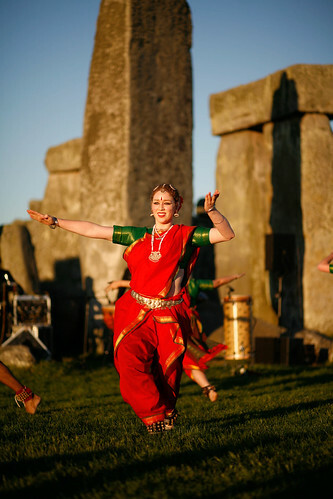 Stonehenge is a protected site and tourist attraction, open to the public every day – so there was no chance to rehearse on site until an hour before the show! We were all nervous about how this would affect the performance. Whilst we are senior Bharatanatyam students, we aren’t professionals, and sometimes this difference in level of experience can be crucial in confidently navigating a semi-improvised collaboration like this. Our biggest challenges were using the stones creatively in the choreography without prior rehearsal, and dancing on grass – a surprisingly resistant surface! Also, we didn’t realise how little dressing time we had when we arrived, and had to do a run-through before we were ready. We ended with ten minutes left to finish dressing and sprinted back to the little office cabin we’d been given to use. The audience were already streaming onto the site, and they pointed at us as we ran past, holding on our jewellery with one hand, our saris flying behind. Ultimately the evening was magical. The sun lowered as we began, and our worries floated away as we just enjoyed dancing in the open air, surrounded by rolling fields, staring sheep and birds circling overhead. It was wonderful to be dancing to live music, especially from the talented percussionists that accompanied Kuljit. Amongst them, they played tablas, djembes, clay pots, bells, steel drums, shakers, snare drums and mridangams. We were also lucky to have our music teacher, Y Yadavan singing. Afterwards, many people came up to us and said how lucky we were to have touched the stones. Normally visitors are kept behind a barrier three metres from the stones, and guards were present to make sure no one sneaked over the rope after the show. I hadn’t realised how rare it was to get near the stones – many years ago I visited when this was still allowed. O Mother Earth! You are born of the power of Lord Vishnu, and are made up of many jewel-like good qualities, therefore I bow to you.